Information on the status of patents can be key for medicines procurement agencies seeking to know if they can source cheaper generic products. Several databases providing free information on patent status were presented yesterday at the World Intellectual Property Organization. The World Health Organization, also invited, hailed the efforts, but warned against listing follow-on patents, which could confuse procurement professionals. And a prominent molecular biologist, chief executive of a patents–and-scholarly database, called for breaking silos to advance innovation. The 29th session of the WIPO Standing Committee on the Law of Patents (SCP) is meeting from 3-6 December. As agreed during the last session of the SCP, a half-day conference yesterday gathered several representatives of publicly accessible databases on patent information status and data, on medicines and vaccines. Esteban Burrone, head of policy at the Medicines Patent Pool (MPP), presented MedsPaL, a database providing the intellectual property status of selected HIV, hepatitis C, tuberculosis, and other patented essential medicines in low and middle-income countries. The MPP, he said, started collecting patent data for its own purposes, and after receiving many requests for data from public health stakeholders, made its patent data public in 2011. MedsPaL was launched in 2016. It covers over 210 patent families, 6,800 national patent applications on 70 priority medicines, in over 110 low and middle-income countries, he said. It also includes licencing and data exclusivity information. The key question MedsPaL is trying to address is whether medicine X is patented in country Y, he said. MedsPaL allows search in three different ways, Burrone explained: by keyword (patent number, brand name…), specific products (formulation…), and country. Those search criteria can be combined, he said. The database also provides expiry dates of patents in the search results, he added. MedsPaL includes information on licences negotiated by the MPP, bilateral licences between originators and generics, compulsory licences, and commitments not to enforce patents on a given product, Burrone said. Information on data exclusivity is also available in MedsPaL Data from 15 countries has been collected for HIV, tuberculosis, and hepatitis C medicines, with expiry dates, he said. A new feature of MedsPaL, which he said went live yesterday, is map views on patent information. Information in MedsPaL is constantly updated, through automatic data fees from Esp@acenet, from the European Patent Office, from national patent collections on WIPO PatentScope, patent holder disclosure, and national/regional patent offices, Burrone said. Thomas Bombelles, WIPO Non-Governmental Organizations and Industry Relations Section, explained the functioning of the Patent Information Initiative for Medicines (Pat-INFORMED), launched in September (IPW, Health & IP, 25 September 2018). Pat-INFORMED, a public-private partnership between WIPO, the International Federation of Pharmaceutical Manufacturers and Associations (IFPMA), and 20 pharmaceutical companies, is a search engine to help pharmaceutical procurement agencies determine the patent status of a medicine. Bombelles said Pat-INFORMED and MedsPaL are complementary and work together to fill the need for information. The public policy questions and challenges surrounding innovation and access to medicines are complex and there cannot be any easy and simple answer, he said. Patent information, he said, is by definition public and available, it is part of the social contract of patents. Patent information has become highly complex and difficult to understand, he said, adding that Pat-INFORMED focuses on specific medicines and key patents on those medicines. Greater transparency of patent information is a universally accepted objective, he said, adding that Pat-INFORMED also answers to WIPO Development Agenda Goal 31 (better access to publicly available patent information), and United Nations Sustainable Development Goal 3 (Ensure healthy lives and promote well-being for all at all ages), Goal 9 (Build resilient infrastructure, promote inclusive and sustainable industrialization and foster innovation), and Goal 17 (Strengthen the means of implementation and revitalize the global partnership for sustainable development). Pat-INFORMED covers six therapeutic areas, Bombelles explained: HIV/AIDS, cardiovascular diseases, diabetes, hepatitis C, oncology, respiratory conditions, and all patented products on the World Health Organization Model List of Essential Medicines (EML). He added that the partnership hopes to expend its disease coverage and the number of pharmaceutical companies involved. Guilherme Cintra, IFPMA senior manager, IP and Trade, said companies are sensitive to the fact that patent law and patent information are complex, and difficult to access. However Pat-INFORMED has some limitations, he noted. In particular, “we think the database gives you a lot of information that would allow the procurement agency to make an assessment, but it is not meant to be a one click ‘you have a freedom to operate’ and you can procure the medicine with 100 percent certainty,” he explained. Pat-INFORMED gives information following “the orange book style standard,” he said, referring to the United States Approved Drug Products with Therapeutic Equivalence Evaluations (commonly known as the Orange Book). But there may be third party patents, or applications, “and you may disagree on what is covered or not, so it is very important that people check,” Cintra said. Pat-INFORMED covers all the countries in the world, including the most valuable markets, and the most valuable patents, Cintra remarked, adding that based on the feedback we may receive [corrected], companies are willing to expand to all therapeutic areas. “We really hope that this will become the small molecule database where all procurement agencies can go” to get a first preliminary assessment of the patent status, he said. The WHO started working on patent information since 2004, he said, with HIV drugs. The organisation then provided patent information for a number of products on the EML, in particular for hepatitis C products. The WHO was able to advise countries which have the highest disease burden, such as Egypt, not only on what the most appropriate treatment is, or how to roll it out or monitoring it, but also on procurement agreements, he said. Beyer mentioned the recommendation of the UN High-Level Panel on Access to Medicines to WIPO, to work on databases linking patents to specific health products. “I am very glad WIPO picked this up together with IFPMA,” he said. WHO usually goes to MedsPaL, Beyer said, in particular because they reduce their list to essential patents, and it also contains negative results, which sometimes are more valuable than finding applications. Of course this is not a freedom to operate either, he noted. He suggested that patents which are expired stay in Pat-INFORMED because it shows a product is off-patent. Otherwise, he said, the product is just not in the database, which could be confusing. Beyer also said he was surprised when he looked at International Nonproprietary Names (INN) of some medicines in Pat-INFORMED. “We know they are generic,” he said, citing for example old antibiotics, combination antibiotics. The patents that are listed are more formulation patents, such as pre-mix formulations for injection, he said. Those are typically patents that would not prevent a generic company from inventing around and coming up with a slightly different product, he said. He suggested that companies further refine the Orange Book definition on which patent are included and “take out the noise”, which would make the Pat-INFORMED even more useful for the health users. Beyer said the WHO is launching an electronic EML and is keen to link this to existing databases. But it might be “tricky,” he added, if old antibiotics, which are generics, are included in Pat-INFORMED and might confuse health professionals and leave them to wonder if the medicine is still patented. The Third World Network remarked on the fact that Pat-INFORMED contains “all kind of patents on the same molecule,” which can scare generic manufacturers and policymakers. Using the metaphor of a jigsaw puzzle, he said patents are only one type of piece of the puzzle. “How can we talk about the patent system in the absence of the rest of the innovation ecosystem,” he asked. “A patent itself is of no economic value and in fact it is a tax on our innovation system, if it is not used to produce economic and social good,” he added. He underlined the importance of breaking silos, taking advantage of the “enormous corpus” of scholarly knowledge produced by public research, for example, to produce goods. Many people like to use the Google patents or Google scholar tool, but “every click you make, every link you take, they will be watching you.” This is not a small thing, he said, there are over a million scholars that have a profile on Google scholar, “and every single action they take on that platform informs the Google ecosystem.” It cannot be removed. The Lens was founded in 2000, hosting 112 million patent records from 95 jurisdictions, and 195 million scholarly records. 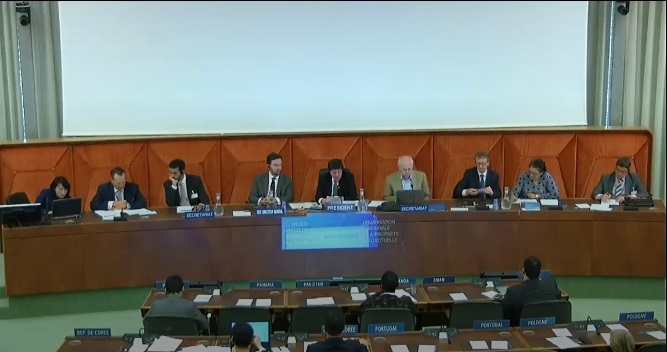 Andrew Czajkowski, head, Innovation and Technology Support Section, Access to Information and Knowledge Division, Global Infrastructure Sector at WIPO, presented the new WIPO patent register portal. It was initially developed in 2013 as part of the Development Agenda Project on IP and the Public Domain, he said. A new Development Agenda project in 2016, on the use of information in the public domain for economic development, spurred the redesigning of the portal, Czajkowski said. The portal includes data from more than 200 jurisdictions and new features include map views, allowing users to visualise information based on pre-selected criteria. "Transparency Of Patent Status Key For Health Actors: Databases Presented At WIPO" by Intellectual Property Watch is licensed under a Creative Commons Attribution-NonCommercial-ShareAlike 4.0 International License.